Newsflash: Unsubscribes happen. It hurts, but this natural list cleaning keeps our email eco-system in balance. And while you can’t avoid the pain altogether, you can dull it greatly by integrating an email preference center into your unsubscribe process. 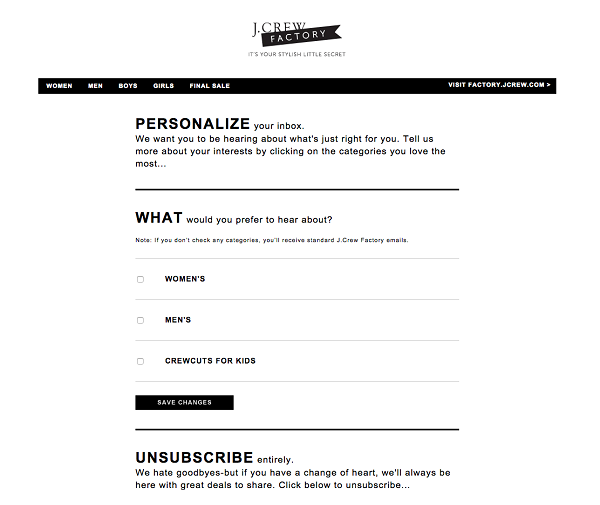 For those unfamiliar with this concept, an email preference center is a landing page the subscriber arrives at after they hit the unsubscribe button. The page allows them to take a variety of actions: update their email address, change the frequency of the mailings, and even opt out for good. 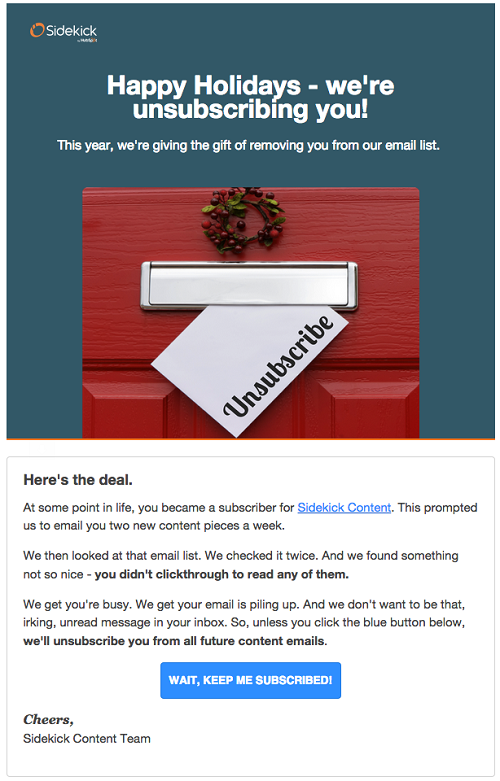 Clicking the unsubscribe button doesn’t necessarily mean a subscriber wants to end their relationship with you. 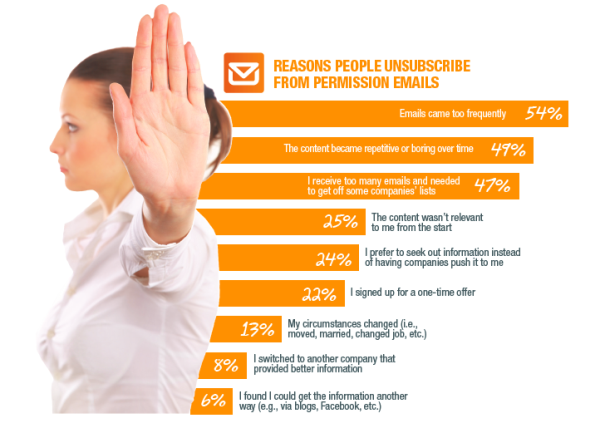 ExactTarget conducted a survey and uncovered the reasons people opt-out. From the graphic above, it is clear that many unsubscribes could be prevented by allowing the subscriber to choose their own sending frequency. 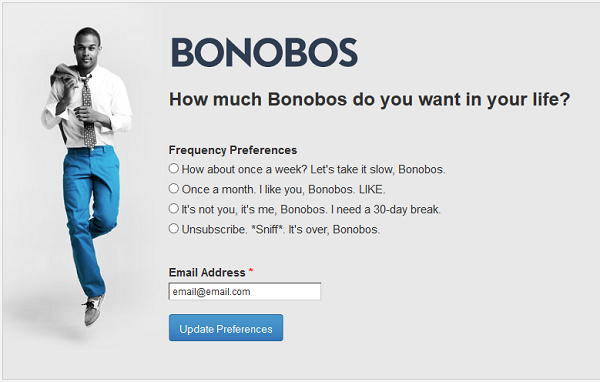 Bonobos did a fantastic job of incorporating this element into their preference center to retain subscribers who want less mail. If you don’t provide alternatives, you will lose subscribers. It’s that simple. Since marketers aren’t in the business of mind reading, one easy way to ensure you are delivering relevant information is to allow readers to self-segment. 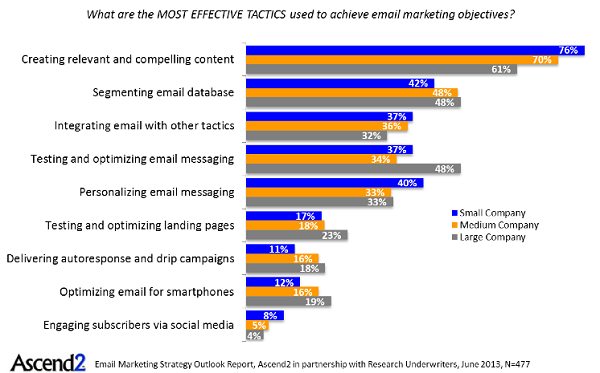 Do you have multiple email lists? Tons of different products? Let your users tell you what they want to hear about through your preference center. J. 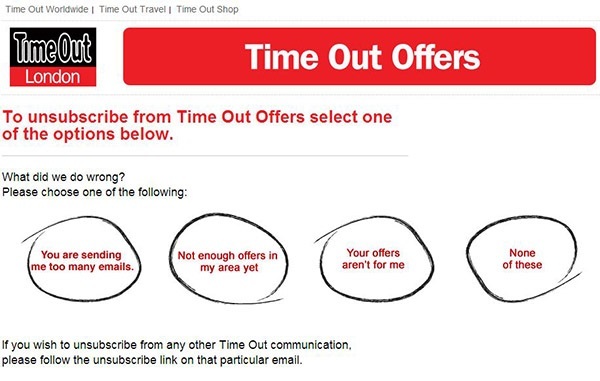 Crew did a great job of letting readers choose what future mailings would be the most relevant to them in the opt-out process, while still providing the option to unsubscribe completely. By leveraging this strategy, you can stop unsubscribes from happening and deliver hyper-customized campaigns. You might even boost your open and clicks rates. Talk about a win-win. Email isn’t the only way to communicate with your audience. Sure, over 77% of consumers prefer to receive promotional messages from companies via email, but you still need to optimize your marketing strategy for those 23% that want to hear from you through other channels like Facebook or Twitter. 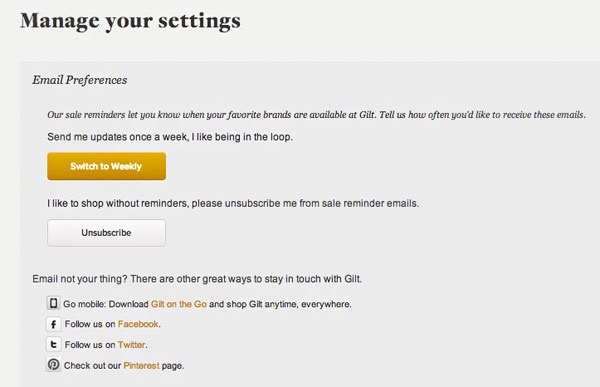 Gilt used this strategy by offering social channels as a way to connect outside of the email realm (yes, life does in fact exist beyond email). No man is an island, right? So don’t market that way. Embrace personal communications through multiple channels. Return Path reports that on average, 15-25% of all valid email addresses are discarded each year as people move to a different ISP, change jobs or otherwise acquire a new address. That’s why you should be proactive and purge inactive users (people who have not opened or clicked in 3 months) from your list. After the subscriber has been unsubscribed, send them a reengagement email that will direct them to a preference center if they want to opt-back in. This creates a cleaner list and provides a reengagement opportunity for the subscribers that are actually interested in hearing from you. Furthermore, internet service providers (ISPs) are becoming more reliant on engagement metrics for detecting SPAM. By unsubscribing dormant members and giving them a way back onto the list through a preference center, you’ll have better opens, clicks and deliverability rates. Sidekick took a very proactive approach to making sure their engagement did not drop due to inactive emails. Check out their witty, “holiday” email where they give (pun intended) readers the option to reengage. So why do subscribers leave? This is where an exit survey can provide a wealth of information. When it is time to bid adieu, ask why and use the feedback to improve your future email strategy. Remember to take advantage of every opportunity to capture feedback from your audience, even if it’s the last one you’ll get. Do you have a tactic that works? Did we miss anything? Share what you do to ensure your readers stay for the long-haul in the comments section below.